..so they dance! : The unavoidable Khan. Isn't there enough talk in the world about this man right here, Shahrukh Khan? When even a Finnish paper has a small bit about his stardom and Berlin visit (and a mention that his latest, Om Shanti Om is screening at Helsinki International Film Festival), it's a sign that either everything that can be said about the man has already been said, or that you can simply discuss him all eternity. I'd prefer if it was the former, but then I think back the last seven days of my life, and it has to be said: I've had plenty of Shahrukh this week. A week ago I saw Chak De India (also at HIFF! ), one of those Shahrukh films I'd been avoiding because it hadn't really interested me (simple as that!). However, I was glad to discover this was not really a Shahrukh Khan movie as much as it was a film where Shahrukh Khan plays a lead character. Some of you might be raising your eye-brows, but those of you who've seen plenty of King Khan know exactly what I mean. I really enjoyed Chak De India, because as stated previously, it's these girls who get to play center stage. It's a sports movie, but definitely among the best, most moving ones I've seen, full stop. 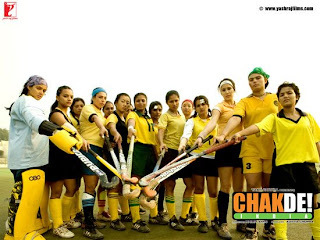 Girl power at the core, Shahrukh's character Kabir Khan also has his own plotline, but just as important, if not more so, are the individual storylines of the female hockey team's players and in typical sports film fashion, the team spirit that allows you to overcome any obstacle. Another refreshing change in the film was the lack of "negative nationalism", or in other words, extremely caricature-like negative portrayal of non-Indian characters. The foreigners are only enemies on the hockey field, and there were no racist or xenophobic insults exchanged. The following day I watched Om Shanti Om for the third time, and I must say I find the movie less enjoyable, less encaging and more overrated with each viewing. I love me some inside jokes, and some scenes are undoubtedly as hilarious as ever (Abhishek and Akshay steal the show at Filmfare, and the build up to Dard-e-Disco picturization is great) but overall the movie just fails to keep me interested. Shahrukh's parodic hamming it up is no longer sympathetic and everything is just so distanced, I can't really believe in the characters or the story. As my friend put it, "great collection of scenes". But the best movies should be more than the sum of their parts, right? I guess I just got a Shahrukh-overdose. And yet, today when deciding what to start my relaxing weekend with, I went with my favourite movie of his: Dilwale Dulhania Le Jayenge. It's difficult to explain why I have such a special relationship with this movie in particular. I guess the most important thing is that it is built exactly like that; a personal relationship. I didn't fall in love with DDLJ because millions of Indians had, or because everybody who liked Bollywood had. At the get go it was simply a film I saw with two stars I wanted to see in more films, Kajol and Shahrukh Khan. I hadn't heard any of the hype. It captivated me even without subtitles, and once I saw it with subtitles, I was even more smitten. It had flaws, too, no doubt, and even today I am very hesitant about calling it 'the best' of anything. At the same time, it holds a certain magic for me not many other movies do. And Shahrukh as Raj is the kind of charming perfection even the man himself hasn't been able to duplicate in anything since (of course, this being merely my own view). As I was rewatching, I realized it's a combination of a lot of small things; the way he calls her "Senorita" even though the story about the Spanish girlfriend sounds a little made up, the smug expression on his face each time he tells her "nothing can go wrong" and the embarrassment when something, of course, does go wrong. But also the big things: the care-free attitude and the promise that he'll be serious when he falls in love, a promise which he of course fulfills..
Whatever the director Aditya Chopra is working on with Shahrukh right now, I know not to expect it to bring out the kind of feelings I have for DDLJ. But I suppose so long as it works, I'll be happy. Agreed, though I thought CDI was miles better than whatever he did in Swades. I think it is better simply because he couldnt result in those dilwallah mannerisms he does in every other role. Lack of romantic interest really suited him. 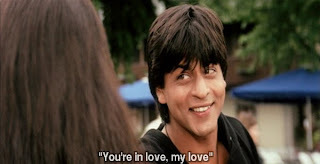 I just re-watched DDLJ last night, and loved it more than ever (I've only seen it three full times). Your post and Memsaab's POV confirms my lack of desire to watch OSO, though I've yet to get Chak De! India. I think it's worth a watch once you feel like you've seen enough Hindi films to get most of the jokes. Mind you, you might already be there, I'm not sure. Worth a rental IMO. If you have to choose, I'd recommend CDI over it, though, definitely. I totally agree with you on this - SRK as the unavoidable Khan. I do like him. Although he is overrated at times but he does bring good films and had some share of bad ones too. With Swades and CDI to his filmography, no wonder why I still adore him. ...this was not really a Shahrukh Khan movie as much as it was a film where Shahrukh Khan plays a lead character. Couldn't agree more on this statement, although I am going through with Chak De India what you just went through with Om Shanti Om. I did love the former the first time though, it's a very good movie regardless. Swades remains my favorite SRK film, though. Nicki - I think he's beyond overrated at times but uhh, that's a rant I'd best not have in a post where I mean to highlight stuff I like about him! :D Swades really failed to impress me, but CDI is my favourite "SRK acting" film.